HTC One mini Case Pluses Taipei City Design from FZtech - Nihao Beautiful Taipei! 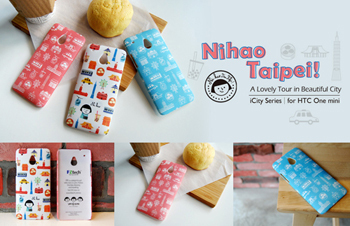 Taipei, Taiwan – FZtech is excited to announce the new collection of protective case for HTC One mini – iCity Series: Nihao Beautiful Taipei. The protective case is made of plastic materials with 2-layer surface coating, offering comprehensive protection for HTC One mini against impacts and scratches. iCity series Taipei is specially designed for HTC models which is meaningful as the headquarter of HTC corporation is located in Taipei, Taiwan. This design of Taipei series features various themes such as landmarks, buildings and local food of the cities. For example Taipei 101, The Office of President, National Chiang Kai-Shek Memorial Hall, The Grand Hotel, National Dr. Sun Yat-Sen Memorial Hall, The Red House and Maokong Gondola. Moreover, the Taiwan yellow cab, MRT compartment and famous food Xiao-long-bao and bubble tea are all included in this series. Those patterns are all design by illustrator Yating Hung, inspired from her travel experience in Taipei. This series has three color options, white (FZT-FTP1), macaron pink (FZT-FTP2) and macaron blue (FZT-FTP3). FZtech mascot fifi said Nihao with colorful city elements which is white background design, and other colored background designs, pink and blue with the patterns of city features in white and fifi is merged in the city scenery. iCity Series is made of plastic with 2-layer surface coating with rubber oil treatment which is extremely durable, making it anti-scratch, anti-dust and non-slip. Weighting only 12.5g, this collection is lightweight, portable and ultra-slim. It covers HTC One mini perfectly and tightly in back and edges, offering comprehensive protection. As a member of Taiwan, FZtech is proud of Taiwanese brand HTC being standing out in global market. FZtech specially apply Taipei city series on HTC models where is HTC’s headquarter located, trying to introducing the beautiful city Taipei to the world. The adorable iCity Series for HTC One mini will be available in Taiwan, Singapore and Thailand soon. FZtech welcomes global distributors, retailers, wholesalers and agents to bring the products worldwide. For more information please visit FZtech online.